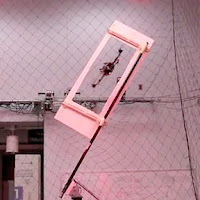 Ever hear of an "autonomous quadrotor helicopter"? That said, in the video above, be wowed by the flips, very precise flights through small windows, and "perching" that this small autonomous Unmanned Aerial Vehicle (UAV) can perform. This device come out of the GRASP Lab at Penn. After her appearances on "Scrubs" and Bobby Flay's "Grill It" show, Jordan Zucker (C'97, Theta) is clearly comfortable on camera!